Padraig Mac Lochlainn, who is serving a three-day suspension, was let vote once – but not a second time. Gerry Adams said Sinn Féin would take legal advice on whether TDs were entitled to vote, even if they were suspended from the Dáil. SINN FÉIN has said it will take legal advice after one of its TDs was stopped from entering the Dáil chamber to vote on Budget measures today. Pádraig Mac Lochlainn, the party’s justice spokesman, was stopped from entering the Dáil as he tried to vote on the Social Welfare Bill this afternoon. Mac Lochlainn was suspended from the Dáil yesterday after a row with the Ceann Comhairle, Seán Barrett, which caused sittings to be disrupted for almost an hour, and is serving a three-day suspension as a result. Party leader Gerry Adams told the Ceann Comhairle that his party colleague had a constitutional right to exercise his vote, as an elected member of the Dáil, and that this was being denied to him by the refusal to allow him into the chamber. Barrett said Mac Lochlainn is still serving his suspension after yesterday’s proceedings, and was therefore suspended “from the service of the Dáil”. He said it was not up to him to discern whether any TD still had a constitutional right to vote even if they were suspended from the House. The Donegal North-East TD missed two electronic votes held this afternoon, but was permitted to enter the chamber for a manual ‘walk-through’ vote on removing a cut to the respite care grant – a process which requires TDs to walk through individual lobbies in order to register their vote on any measure. When a second walk-through vote was held on the Social Welfare Bill as a whole, Mac Lochlainn was denied entry. Mac Lochlainn was suspended yesterday morning after raising objections to the manner in which Barrett had treated Adams during Tuesday’s session of Leaders’ Questions. He claimed the Ceann Comhairle had been inconsistent in criticising the ULA’s Joan Collins for potential abuses of parliamentary privilege, while permitting Taoiseach Enda Kenny to allege a connection between Adams and the disappearance of Jean McConville. TDs voted to eject Mac Lochlainn from the Dáil, but the deputy refused to leave – prompting further suspensions of 15 and 30 minutes until he relented and agreed to leave and allow business to continue. Email “Sinn Féin to take legal advice after TD is stopped from voting”. 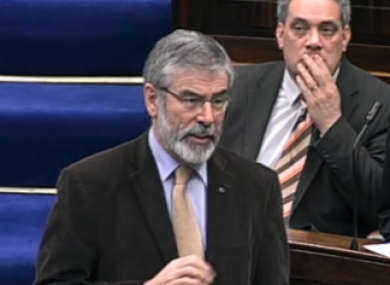 Feedback on “Sinn Féin to take legal advice after TD is stopped from voting”.